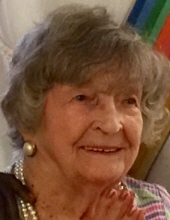 Mary (Pawlowicz) Duteau, our beloved “Babchi” went home to the Lord on Sunday, February 3, 2019. On July 22, 2018, Mary celebrated her 100th birthday with a Mass, music, food, and family. It was a blessed event for all! Mary was born in Gardner, Mass on July 22, 1918. She was one of 4 children born to Antonia and Stanley Pawlowicz. She completed eighth grade and because of The Great Depression and the needs of her family, was forced to leave school and go to work to help support the family. Mary married Marlin Duteau and they were blessed with two children: June Elizabeth and Robert Edward. Mary and Marlin subsequently divorced, and Mary took on the responsibility of being both father and mother to their children. Mary was a devoted mother and often worked two jobs to support and educate her children. During WW II, Mary, “Rosie the Riveter” worked at Florence Stove, riveting airplane wings as part of the war effort. After her children were educated and married, Mary returned to school, earning her High School Diploma, an Instructors license in hairdressing and certification as a Hair Coloring Specialist. She was a senior instructor at Leos Beauty Institute as well as a consultant to the L’Oréal Group and several other companies. Mary enjoyed her profession, working well into her early eighties. Mary moved to Concord, Mass. to be near her daughter and family. She quickly became a “Concordian”, adopting her new friends with vigor and enthusiasm. She loved to cook and was well known for her banana breads, chocolate chip cookies, pierogi, golomki, and other Polish dishes. She crocheted many beautiful Afghans and was pleased to give them away. Yes, Mary was always busy. She maintained a daily schedule right up until a month ago. Daily, she did exercises, dressed stylishly, fixed her hair, put on earrings, and was ready to greet guests. She dedicated part of her day to prayer – Mass & the Rosary. She had a special devotion to the Blessed Mother throughout her life – her Faith was the foundation of her existence. Mary lived the last decade of her life in comfort surrounded by loving people. SHE WAS SO HAPPY! We thank the Lord for this remarkable woman. She was predeceased by her son, Robert, sisters: Stacy Marysz, Jennie St. Hilaire, Eleanor Baltakis, and her former husband Marlin. Remembering and missing her are: June & Walter Miles, Tracy Miles, Christopher & Amy Miles, Erica Miles, Corben Miles, Philip Marysz, Nancy & Dan Moraski, Dr. James St. Hilaire, Rosalie Duteau, Debbie Duteau, Michael Duteau, Maddie & Briahna Duteau, Gage, Kylee, and Avery Duteau as well as many neighbors and friends. Family and friends will gather for a period of visitation in the Dee Funeral Home, 27 Bedford Street, Concord Center on Friday, February 8th from 9:30 to 10:30 am. Her funeral Mass will be celebrated at 11 am in St. Irene Roman Catholic Church, 181 East Street, Carlisle. Burial will be at St. John’s Cemetery in Gardner. In lieu of flowers, Mary’s family would appreciate contributions in her memory to St. Jude Children's Research Hospital, 501 St. Jude Place, Memphis, TN 38105 (www.stjude.org). "Email Address" would like to share the life celebration of Mary A. Duteau. Click on the "link" to go to share a favorite memory or leave a condolence message for the family.